A Thought: God’s Beauty. The dogwood trees have been spectacular these last couple of weeks! 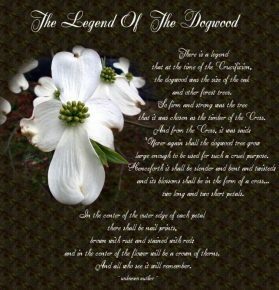 The dogwood tree has a special legend I’m attaching to this ‘Thought.’ When you see this tree in bloom, be reminded only God can take something dry and dead in its earlier stage, and create something of extravagant beauty. Happy Monday! 2 Cor. 5:17 “Therefore if anyone is in Christ, he is a new creation. The old things have passed away; behold, the new has come into being.